The western U.S. has more than its fair share of needs when it comes to security. 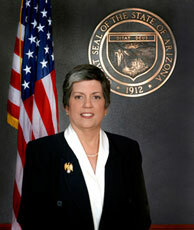 Newly minted Homeland Security Secretary Janet Napolitano will have her hands full prioritizing and distributing money in the western states to make the country safer. The nation’s top domestic security official toured Southern California’s bustling ports and biggest airport Monday as local officials plied her with requests for financial help to upgrade potentially vulnerable facilities. Homeland Security Secretary Janet Napolitano took a flyover of the ports of Long Beach and Los Angeles and surveyed recent security improvements at Los Angeles International Airport, including better fencing, systems to screen passenger vehicles and concrete barriers to prevent vehicles from crashing into airline terminals. “It would be hard to identify a more critical area of the country in terms of the impact on infrastructure and on commerce than this area of Southern California,” Napolitano said in a news conference at the U.S. Coast Guard station on Terminal Island. U.S. Rep. Jane Harman (D-Venice), who accompanied Napolitano on the tour, said she and other local officials outlined other critical security upgrades in need of federal financial aid, including $60 million to complete the airport’s border fence. Harman said officials urged Napolitano to waive federal rules requiring local governments to kick in 25% of project financing. Posted: 4/14/09 at 8:05 AM under News Story.